Goodwood Primary School was built in 1879 and in its first year had an enrolment of 200 students. By 1903 this figure had increased to more than 700. Today we have about 425 students in the main school and 56 in the preschool. The new school buildings were erected in 1975. In 1978 Goodwood Community Services occupied the rear of the gymnasium and thus began the close community atmosphere which still pervades our school. The school was originally built in an Open Space design, but over the years many of the classroom spaces have been enclosed to make more conventional classroom areas. The advantage the school has is that many of the classrooms still have access to the facilities purpose-built for the Open Space environment. Withdrawal rooms now serve as Intensive English language Classes or Special Education assistance rooms. Many of the classrooms also have direct access to wet areas for Art work or Technology instruction. There is a range of play equipment for students to use during break times and shade is provided by large plane trees in the main yard, while shade structures protect the play equipment areas. The grassed oval area, basketball and netball court and the organised activities offered at lunch times on most days of the week, ensure that children have a fully occupied and enjoyable playtime. 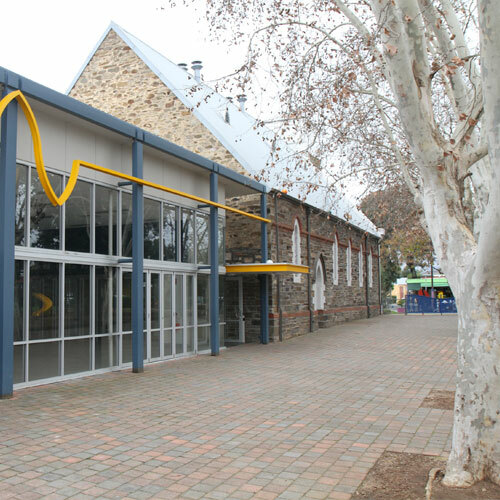 Recently we have had a multipurpose Performing Arts Centre (PAC) built along side our historic Church building, which is our gym facility. As part of this complex we have a specialist Italian/ Science classroom, a uniform shop and meeting room. Our PAC, meeting room, Gym and Activity Room are regularly hired by community groups (see services). We have another site one block away with a tennis court and Community garden: The Goody Patch; Surrey St Goodwood. This is a wonderful environment which has been embraced by the school and wider community.